60s Retro Glam: Mad Men Makeup. 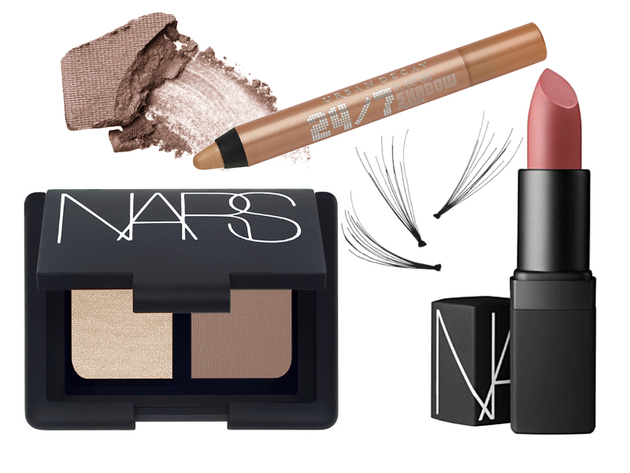 It’s time to wake up your makeup routine with a little extra glam. The best way to try something new is to borrow from the past, especially when Mad Men retro trend is on the rise. Mad Men retro-inspired looks wowed women, making them want to recreate Joan Holloway’s or Betty Draper’s looks. Learn how to master a night-out Mad Men retro glam 60s makeup. For a defined brow, use a product one or two shades darker than your natural color. Try a powder like Lorac eye shadow in dark brown to fill in brows. This creates a natural sheen and helps fill in sparse areas of the brow. Use a loose translucent powder to set the brow. This will keep the brow color on, as well as diffuse and soften your Mad Men makeup look. Use Urban Decay 24/7 glide-on shadow pencil in Lit all over the lid of the eye as a base. Apply to inner corners to brighten and open the eye. If you are feeling bold, apply one or two individual lashes to the outer corners of the lash line. Try Lash Dash individual lashes. This will give your lashes a heavier, doll-like appearance. For your 60s Mad Men retro glam makeup, apply the left side of NARS Bellisima duo eyeshadow on the lid. Then apply the darker shadow in the crease of the eye. Layer the eyeliner to create a smooth, rich, pigmented black line. Start with a black eye pencil tracing the lash line. Use a liquid or gel liner to layer over the top of the pencil to add a defined, sharp look to the eyeliner. Deepen the roots of the lash using black eyeshadow with a precision brush. Finish the lash look with layers of NARS Larger Than Life mascara. For your Mad Men makeup, the dark eyeliner enhances the eyes, but the shimmery shadow keeps the look from being too overwhelming. Achieve perfect nighttime Mad Men eye makeup by thickening the eyeliner and also tracing it on the lower lash line: start at about 1/3rd of the way into the eye from the outer corner and follow the bottom lash line to the end of the outer corner and straight up. Stop before it hits brow bone. For voluptuous Mad Men lips try the NARS sheer lipstick in Dolce Vita. Apply a drop of lip gloss in the center of the lip. Finish off your retro Mad Men look with one of the glamorous 60s hairstyles.